According the fifth century BC Greek historian Herodotus, who has often been called the “father of history,” the Lydian King Croesus (ruled ca. 560-540s BC) was the world’s wealthiest king who ruled the world’s wealthiest kingdom. When Salon, the legendary Athenian law giver, came to Lydia see the king’s wealth personally, Croesus immediately had his servants “take him on a tour of the royal treasuries” in order to “point out the richness and magnificence of everything.” Because of Herodotus’ writings, Croesus became known as one of the wealthiest men of his time, which an examination of the historiographical and archaeological sources certainly confirms. Croesus was the fortunate recipient of a wealthy kingdom that his ancestors had established years before he came to the throne. The kingdom of Lydia boasted of a river that was filled with the precious mineral electrum and on its banks was one of the world’s first gold refineries. The Lydians were also known for being some of the best merchants in the ancient world and are credited with being the inventors of money as it is known today. When Croesus came to power, though, he did not rest on his laurels and instead took that wealth to make his kingdom even richer through conquest and by inviting some of the greatest thinkers of the Hellenic world to teach his people, which ultimately made the king the richest man in the ancient world in more ways than one. At its prime during the reign of Croesus, the Kingdom of Lydia was one of the most powerful states in the eastern Mediterranean region. But before it became one of the premier powers of its time, Lydia was one of several kingdoms in Anatolia, which was roughly congruent with the modern country of Turkey, to have emerged after the collapse of the Hittite Empire around the year 1200 BC. For quite some time, the Lydians shared Anatolia with the kingdoms of Uratu and Phrygia, but later used their economic dominance to field armies that would conquer most of the region. Linguistic and culturally speaking, the Lydians were Indo-European peoples, much like their Hittite predecessors. Although the Lydians were a literate people, modern reconstruction of their dynastic chronology has largely come from Herodotus. According to Herodotus, the first major Lydian dynasty was known as the Hercalid, after the mythological Greek hero Hercules from whom the later kings of the dynasty believed they were descended. The Hercalid Dynasty established many of the cultural hallmarks of ancient Lydia, but was eventually overthrown around the year 680 BC. In that year one of King Candaules’ bodyguards, Gyges (ruled ca. 680-652 BC), killed the king, took the throne, and established the Mermanadae Dynasty  The Mermanadae Dynasty transformed Lydia into the wealthiest kingdom in the ancient world, which reached its peak with its fifth and final king, Croesus. Just outside of Sardis was the source of much of the Lydians’ wealth: the Pactolus River. The river was known for its valuable electrum deposits, which is a naturally occurring alloy of silver and gold. After the electrum was mined from the river, it was then brought to Sardis were it was refined into gold and silver in what was one of the world’s first precious metals refineries. Modern scholars generally attribute the mining of gold and the minting of coins in Sardis to Gyges. Although the mining of precious metals was done in other Bronze Age cultures long before the Lydians, the use of coins as a currency standard was a revolutionary step forward in economics. 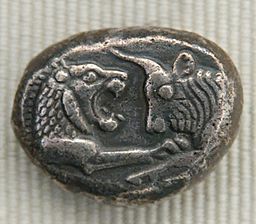 Up until that point in world history, most people traded gold as dust or in ingots, which was often unreliable and cumbersome, but the Lydians were the first people to “use gold and silver coinage and to introduce retail trade.”  The wealth of Lydia was already well established by the time Croesus came to power, but like a good entrepreneur he was able to parlay his inherited riches into even more wealth. When Croesus came to the throne at the age of thirty-five, he set about to make his already powerful and wealthy kingdom even more so through a combination of conquest and diplomacy. The king used his wealth to field an army that was able to overcome most of his neighbors, including the Phrygians and Ionian Greeks. Once established as the ruler of Anatolia, Croesus then decided to invite some of the most learned men of the world to visit Sardis. Herodotus noted that during this time “all the great Greek teachers of that epoch . . . paid visits to the capital.”  Croesus may have invited these men to his kingdom at least partially to show off his wealth, but the end result was that Sardis’ intellectual and cultural wealth was increased. Artists as well as philosophers traveled to Lydia to hone their skills and help make the kingdom a financial and cultural center. As Greek, Egyptian, and Babylonian scholars, artists, and statesmen visited Lydia to admire its wealth and culture, Croesus became a victim of hubris. Believing that he had adequately paid the Oracle enough to get the answer he desired, Croesus then developed an alliance with Sparta, Babylon, Egypt, and Media against Persia. When Croesus led Lydia against Persia in the Persian-Lydian War of 546-541 BC, he clearly overestimated the influence of his wealth. With the exception of mainland Greece, the Persians gobbled up all opposing kingdoms and took the richest man in the world as their captive. According to Herodotus, after a miraculous scene of divine intervention, the Persian King Cyrus allowed Croesus to live at his court. The Babylon Chronicle on the other had states that Cyrus conquered Lydia and “killed its king, took his possessions, put (there) a garrison of his own. It will probably never be known what happened to Croesus, but the reference in the Babylonian Chronicle to Cyrus taking his possessions seems quite likely. It would stand to reason that once Cyrus deprived Croesus of his wealth and kingdom there would have been little reason to keep him alive. 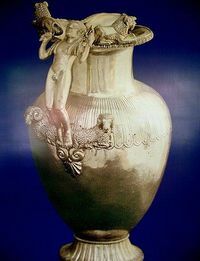 An examination of Croesus of Lydia reveals that it was no accident that he became the richest man in the ancient world. Croesus had the benefit of inheriting great wealth from his ancestors and also the advantage of his kingdom being located in an area rich in precious metals. With that said, Croesus added to his inherited wealth through conquest and eventually made Lydia wealthy beyond gold or silver. It was under Croesus’ rule that Lydia became one of the cultural centers of the ancient world and was visited by some of the world’s greatest thinkers. 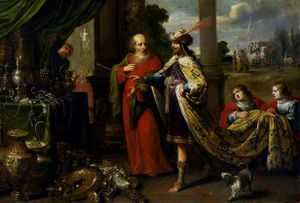 In the end, Croesus was the victim of his own ego, which probably cost him his life and the independence of his kingdom. 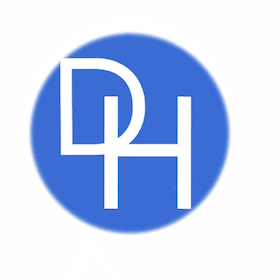 Despite his fair share of flaws, hubris being the most prominent, Croesus will always be remembered as the wealthiest man in the ancient world and one of the first advocates of coinage.